Solid Hookups: Tall glass of Allens anyone? Tall glass of Allens anyone? PORTLAND, Maine -- The dark-brown liquid that some people call "the champagne of Maine" tastes, to the uninitiated, like equal parts alcohol, sugar and coffee-pot slag. It puckers the cheeks, coats the tongue with syrupy sweetness and leaves a mouthwash feeling on the lips. 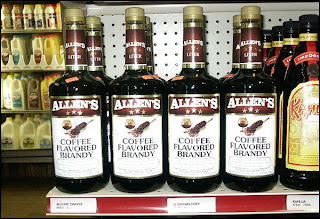 This is coffee-flavored brandy. It is one of the odder stories of American imbibing, the number-one-for-20-years-running liquor obsession of Maine. The caffeine-infused spirit, largely unknown outside New England, is a staple at house parties, mill town bars and urban street corners here -- popular enough that a Bangor newspaperman once suggested putting it on the back of Maine's state quarter. Neil, I miss you. I misss your musk, I miss being near you. Are you coming ice fishing with us this year? I think it's important that you do. The BFCA is in full effect bro.